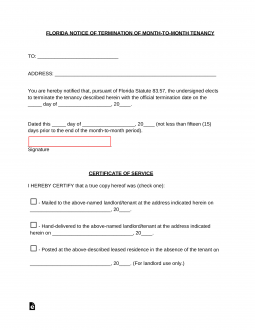 The Florida Termination Letter Form is a required document when one wishes to end a month-to-month agreement in this state. This state will require that fifteen (15) days’ notice be given by whichever party wishing to end a month-to-month lease agreement. This will serve to prevent the party receiving the notice from being forced to endure hardships as a result of their lease’s termination. In this way, a balance of flexibility and responsibility is provided to both parties. This is, after all, the type of arrangement that would have a significant impact upon dissolution. A landlord will need to replace the lost income from a tenant who is terminating the lease, while a tenant would need to find another place to live should the landlord wish to terminate. The termination letter requirement Florida requires when dissolving a month-to-month agreement will enable a landlord to possibly replace the tenant income or giving the tenant the chance to avoid being homeless suddenly. This termination letter should be filled out by the individual leaving, sent in a reliable manner to the receiving party, and ideally, the issuance should be provable. This will help the issuer avoid any unpleasantries or here say regarding a timely delivery of this notice from a disgruntled receiver. Step 2 – Enter the address where this notice is being delivered. Step 3 – enter the date the of this notice. Step 6 – If this is written by the landlord and will be posted check the second box then the date it is being posted on the tenant’s domicile. Step 7 – Sign the document.